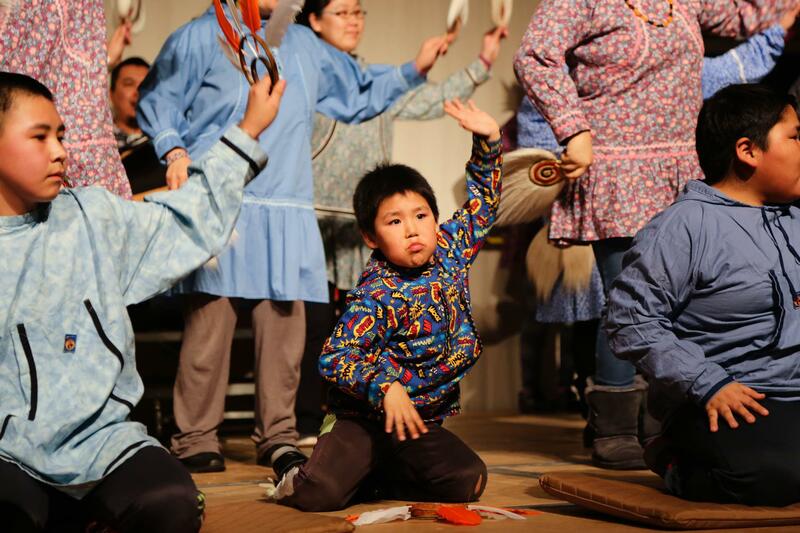 The smallest Kasigluk dancer performs with his community dance group at the Cama-i Dance Festival on March 16, 2018 in Bethel, Alaska. Friday begins the cultural explosion of the Cama-i Dance Festival. The dancing begins this evening at 5 p.m. at Bethel Regional High School and will last through the weekend until late Sunday night. Dance groups from across the region, the state, and the lower 48 are gathering to share dance, culture, tradition, and community. Across the Yukon-Kuskokwim Delta, dancers are getting ready to take the stage. “And that," Curda said, "has resonated with people in ways that I didn’t know would happen." Take the logo, for example. It’s carved by Bethel artist Jerry Lieb. It’s a spirit mask, representing the man who brought the region’s tribes together after the division and violence of the Bow and Arrow Wars. The man told the tribes “to put down the bow and arrows and to pick up the drum and dance." “His family will be here [and] his wife. Ossi Kairaiuak, who is with Pamyua, has written some original music to honor Walter Lewis," Curda said. That performance is Friday at 8:30 p.m. Soon after, another group which has not been at the festival for over a decade will dance on the Cama-i stage. The Scammon Bay Dancers are returning for the first time since their famous and charismatic leader Maryann Sundown passed away 12 years ago. “We used to call her ‘The Dance Diva of the Delta,'” remembered Curda. Other regional groups this year are Kalskag and Tuluksak. Toksook Bay singer and drummer Byron Nicolai from “I am Yup’ik” will perform. Many Bethel groups will also be dancing, including the UAF Kuskokwim Campus Dancers. Last year, beloved campus director Mary Pete died. In her honor, the dancers will be performing a traditional song from Mary Pete’s community of Stebbins. The dinner serves about 700 people every year, starting with Elders, moving to dancers, and then to the public. To make a donation, bring your Native food to the Lower Kuskokwim School District office on Saturday in a dish with your name on it. Dinner starts at 4 p.m.